I was born in Buenos Aires, on March 20, 1957. When I finished my secondary education, I enrolled in the National School of Fine Arts Prilidiano Pueyrredón, where I was granted the degree of National Professor of Drawing and Painting in 1982. From 1985 to 2008, I pursued my career in teaching: I worked as a Plastic Arts teacher in primary and secondary schools, and coordinated workshops for children and teenagers in La Lucila and Tigre. In 2010, I,ve started devoting more time to my vocation for the art. I,ve participated in workshops of the teachers Ana Pagani, Rebeca Mendoza, Laura Benchetrit and Luis Altieri. My works are born the very moment feeling synchronizes with doing. There is no space… there is no time… the abstract always seeks to predominate, and being responds to an invisible cause that shapes it following a drive that vanishes when the work is finished. I like to start my paintings with stains of colors, trying to generate visual textures through the combination of different materials. I gradually leave delicate traces of known shapes which I then spontaneously and unconsciously transform until I feel that my perception of the world and the essence of my self are present in the work. 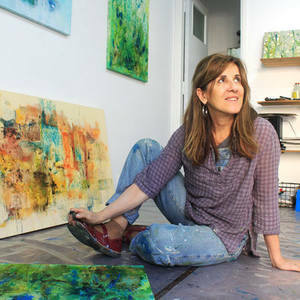 Nowadays, I work in Buenos Aires in her studio in La Lucila.